Important: We now offer an All-in-one Battery Management (BMS) kit consisting of the SC-2030 Charge Controller, the TM-2030, shunt, temperature probe, communication cable, wiring harness at a discounted price. Contact us for pricing, promotions & availability. Watch this page for news about products under development – products that will add more capabilities and value to the Trimetric Battery monitor & charger and will work those already in the field. Send us en email if you want to be on our mailing list. 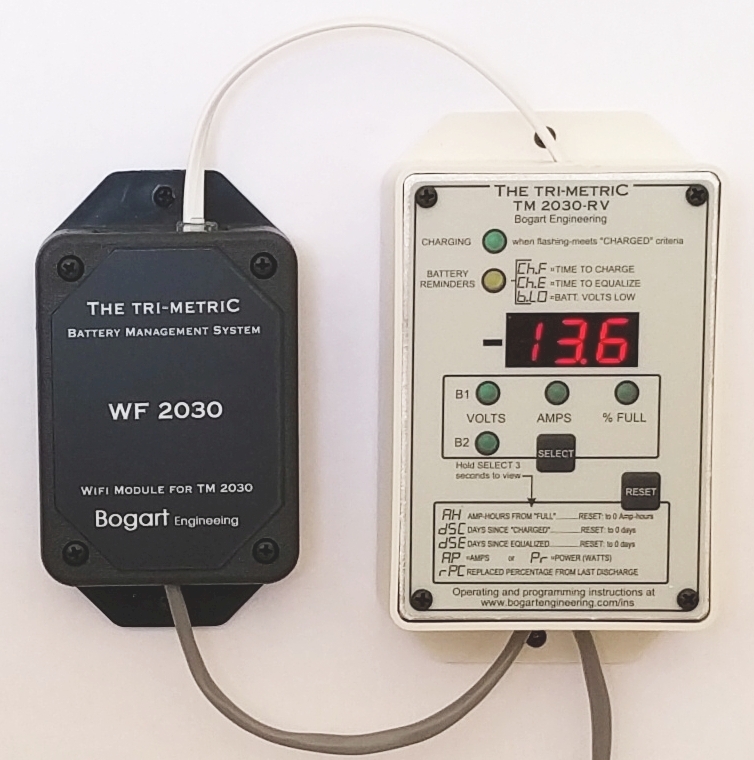 Introducing the newest member of the Trimetric line – WF-2030, WiFi Module to the TM-2030 Battery Monitor. 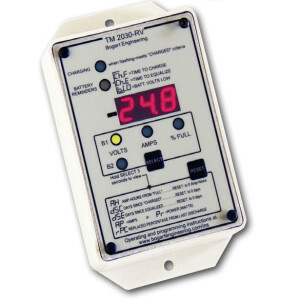 • Most popular choice for monitoring off-grid homes, RV’s or boats. • View history data to identify system problems. • The TM-2030-RV is easily fastened to a wall. The TM-2030-A fits into a “double gang box” and is easier to flush mount. • Works with the TM-2030 Battery monitor as a 4-stage PWM charge controller to provide precise charging in accordance with battery manufacturer recommendations. • Returns a measured amount of amp hours—and also has a higher voltage, current regulated finish charge to avoid battery undercharge or overcharge or sulfation. • Connects to TM-2030 monitor with crossover-type telephone cable (included with each SC-2030) to access all settings and readings. • 30 Amps maximum solar current, 12 or 24V systems, PWM technology at lower complexity and cost than MPPT technology with approximately the same efficiency when using solar panels with voltage matched to batteries. • More data than the TriMetric and more complex. Control with local LCD data display or use computer with optional internet access to data. 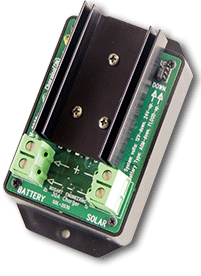 • Three amps channels to separately monitor battery amps, solar amps and an additional channel. 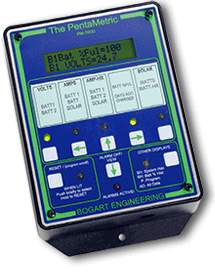 • Data logging: Periodic measurement of solar input, percentage full, volts, watts, amp-hours, charge-discharge efficiency factor and more.